So last few days Nifty is witnessing a correction after making an all time high of 10137.85. 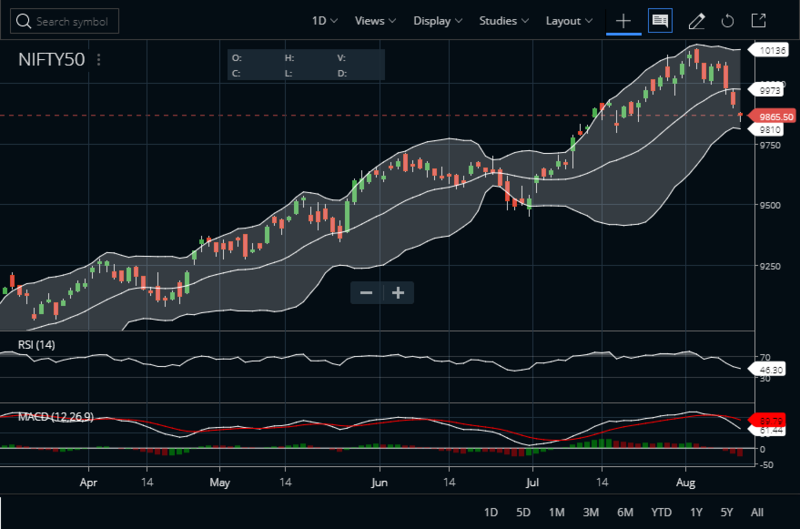 The main trigger of the last correction was the release of SEBI 331 shell companies list that has created a confusion in the investors’ mind after the spectacular bull run starting right after breaking out from above 8600 Nifty levels. Now lets identify the Nifty trading strategy in this bull market correction. I feel that this market is still a bull market and not a bear market and this is the first major correction in this bull market. So we need to apply trading strategies for a bull market correction as corrections in a bull market can show sudden fall with an unexpected bounce that can trap small traders easily. I will create my next Nifty trading strategy using my analysis from Advanced Get software. Let’s check what the market tells us now. See the image above, Nifty analysed in Advanced Get shows that a type-2 trade may be on the way. So it tells us to short the index with a stop loss above all time high with a target of the last wave 4 low, i.e. close to the 9450 levels. Now, let’s check Nifty index Fibonacci retracement analysis. Check the image below. The Fibonacci retracement analysis shows that in case Nifty retraces till 25% level that is 9577 mark and if it retraces till 38% level it will come down to 9280 zones. So this also confirms a correction till the 9450 zone at least. Now lets analysis the index on the basis of Advanced Get GANN levels also known as TJ’s Ellipse. Check the first support comes at yesterday’s low zone (that is already broken today, i.e. 10th August 2017). The next support zone comes close to 9650 level from where a bounce is expected till 9950 marks again. So all the last 3 analysis shows that Nifty has a chance of correcting till 9650-9450 zone. So it’s still more than 200-400 points away. Our current Nifty trading strategy should be, sell on rallies. Is there any hope for the bulls now? The only hope for bulls is that the index is now very close to the daily lower Bollinger Bands. Check the lower Bollinger Bands is around 9800 levels. So bulls should carefully watch that zone and look for any bounce from the daily Bollinger bands. In case we get a bounce from close to 9800 zones it will refine the Nifty trading strategy with a better short entry between 9900-9950. Please do not short positionally till you get a good bounce, you may be trapped. Range play will continue and trading the markets will not that easy, intraday traders can buy on dips as well as sell on rallies, you can make money both ways. Positional bias is marginally down for target of 9650-9450. Harsh you can contact us here.